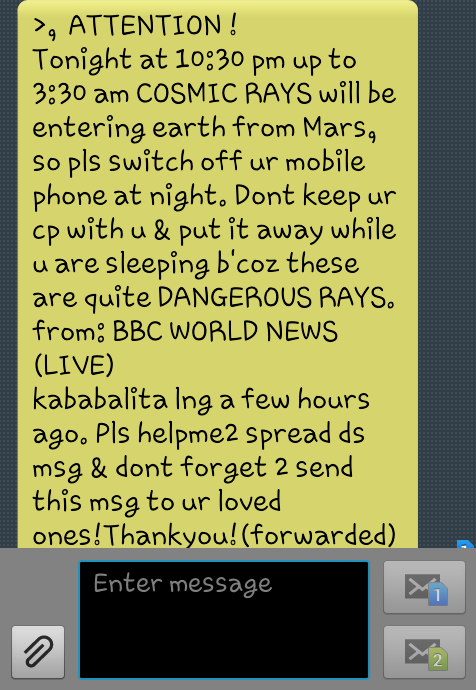 MANILA, Philippines - 'Cosmic rays' hoax has re-appeared on social media Sunday night, September 14, 2014 as many netizens have received suspicious text messages saying that we need to turn off our phone because cosmic rays from Mars are entering Earth tonight. Netizens were worried and asking for reliable sources to verify the claim of the viral news on social media. 'Cosmic rays' immediately became a trending topic on micro-blogging site Twitter. The hoax message with information attributed to NASA and BBC says, "Tonight from 10:30 pm to 3:30 am cosmo rays entering Earth form Mars. So switch off your mobile at night. Don't keep your cp with you and put it away while you are sleeping because these are quite dangerous rays." Less gullible netizens have pointed out that Mars doesn't emit the said rays and neither NASA has issued any such advice nor the BBC has reported the story. Why the news is untrue? Hoax-Slayer has reported that the claim of dangerous cosmic rays is a silly hoax. "No, dangerous cosmic rays will not be entering Earth from Mars tonight or any other night. Or any other day, for that matter," the website said. 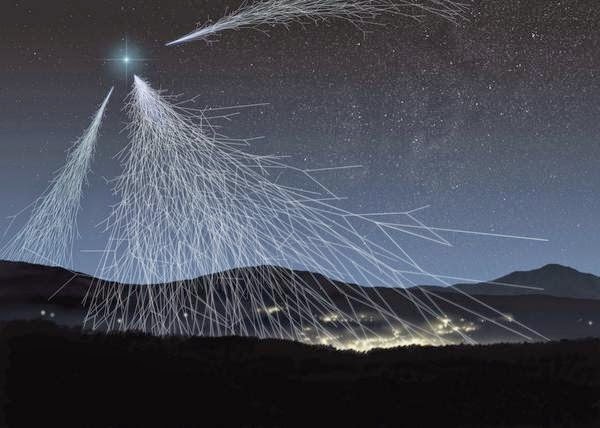 Based on research, cosmic rays are emitted by stars like bodies that are undergoing nuclear reactions that is fusion (as occurs in our sun) or fission (as occurs in nuclear reactors). Mars is not a star but planet that just reflects sunlight. It cannot emit cosmic radiation. In addition, the magnetosphere of the Earth absorbs and protects us from the sun’s harmful radiation. Whatever remains is too feeble to affect any thing as far as Earth. Some say that the purpose of those who spread the hoax news is just to disturb the lives of other people. Reports say that the panic messages have been circulating since 2008 and it suddenly reappeared today for whatever reason. So don't worry. Just keep your mobile phone on. There could be an important call coming.